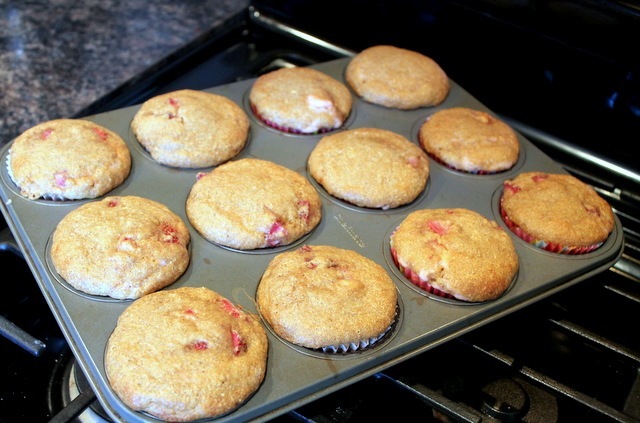 Being that today is the first day of spring and all, I made you guys some delicious, spring-like muffins. Actually, I guess I technically made myself these muffins, but I’m hoping that by my sharing them, you’ll end up making a batch of your own. I’m “planting the seed,” if you will. I’ve been wanting to bake up a batch of muffins for a couple of weeks now, but I kept putting it off since I wasn’t quite sure exactly what I wanted to make. But then, out of nowhere this morning, it hit me. I knew exactly what I wanted to make…and the most exciting part is that there’s sooo much more going on here than meets the eye. 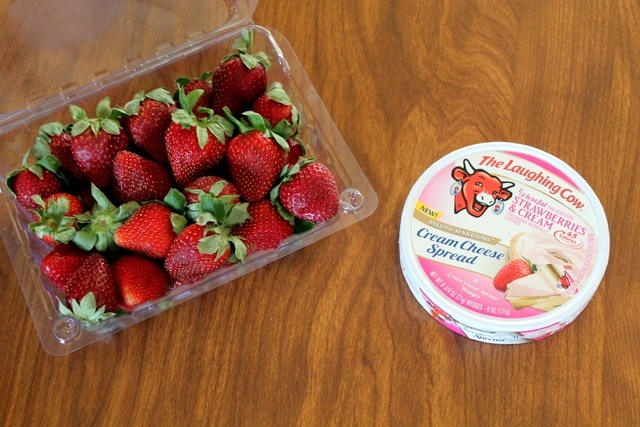 The other day, I finally ended up finding some of the new Laughing Cow Strawberries & Cream Cream Cheese Spread at the grocery store. I picked it up, not quite knowing what I wanted to do with it at the time, since I don’t eat bagels with cream cheese very often. So you know what I can do with it? 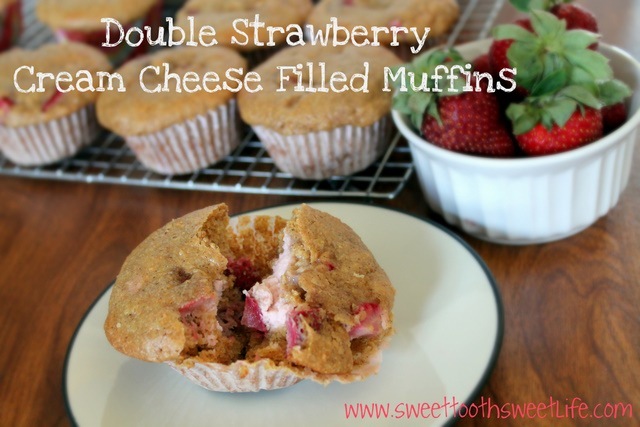 I can use it to make these Double Strawberry Cream Cheese Filled Muffins, that’s what. And better yet? They’re healthier, too! **You can also substitute 4 oz. of light strawberry and/or plain cream cheese for the Laughing Cow wedges. Preheat the oven to 350 degrees. Prepare a 12-cup muffin pan with paper liners or spray with non-stick cooking spray (you can also spray the liners lightly). In a small bowl, combine cream cheese wedges, egg white, and vanilla and mix well. Set aside. Spoon into muffin cups, filling half way to the top. Add about 2 teaspoons of cream cheese filling to each muffin. Top with remaining muffin batter. Bake for 14-17 minutes, or until the tops of the muffins spring back when lightly touched. Remove from pan and allow to cool on wire rack. ENJOY! Just like their blueberry cousins, these babies are knockyoursocksoffamazing. Definitely the perfect way to celebrate the arrival of spring if you ask me. What’s your all-time favorite muffin? The best you’ve EVER had? « I’ll Be There In Five! wow, these look so good!! i've never seen that laughing cow strawberries 'n cream spread, so i'll have to keep my eye out for it at the grocery store. i love muffins of all kinds... it's so hard to choose a favorite, but i would say pumpkin chocolate chip or blueberry would be at the top! All time favorite has to be banana. My Mom's banana muffins were always my favorite! Has anyone ever told you that you're a baking genius??? My current favorite muffin is a toss up between blueberry and banana nut! I'm pretty sure these babiesxwiyld make the cut after a bite! These look absolutely delicious! I cannot wait to find the Laughing Cow cream cheese near me! The flavors sound yummy! :) My favorite muffin is blueberry! My work provides us with free breakfast Friday mornings and they used to get the most incredible blueberry muffins from a local catering company. They since stopped getting food from that company. Needless to say, I miss my muffin! Those muffins looked amazing!! I will definitely have to try them! Not being a fan of banana, is there something I can substitute that with or can it be omitted completely? Yes! You could either omit it or replace it with about 1/3 cup unsweetened applesauce! I have recently discovered your blog! Love it! You have motivated me to eat healthy without sacrificing delicious food...and maybe peruse my dream of getting my personal training certificate! I just recently made a similar muffin recipe and have been making them a couple times a week! I love that strawberries season is beginning! Although mine don't have the filling, I've never heard of that laughing cow flavor, it looks amazing though! you are very smart. must find that laughing cow STAT. and i miss you something terrible. xo. These look great! Question- Do you think it would it be okay if I used 1 1/2 cups whole wheat flour? Definitely. The texture might end up slightly different, but it will totally work! Ah I really want to try that Laughing Cow Strawberry Cream Cheese Spread!!! I love all of their other products and that sounds so delicious, as do these muffins! YUM. Hmm those look absolutely delicious! Where did you find that laughing cow spread I've never seen that before. My favorite are probably cinnamon swirl. These look amazing! I'm wondering though, since I'm gluten-free and dairy-free, if this recipe could be veganized and gluten-free? Hmmm, I'll have to try it out and let you know! 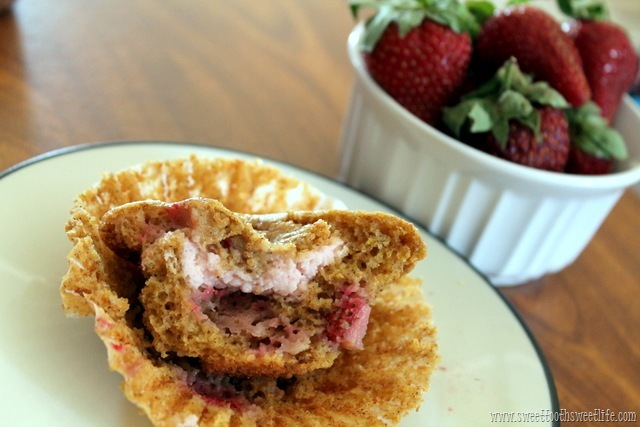 Favorite muffin: I LOVE the Costco muffins with the coffee cake/maple topping. Unfortunately, I can't eat them anymore because of the gluten and they're not vegan...but this makes me think I should create my own version! I'm normally just a fan of blueberry muffins, but these look great! Those look great! I don't think you can get that flavour of Laughing Cow up here in Canada yet, but I'll keep my eye out. My fave muffins are homemade pumpkin or banana chocolate chip. I make muffins at least once a week. Love them! Oh. Em. Gee. Where have I been?? Since when does Laughing Cow make a strawberries and cream flavor?? YUM!! PS. will you beam me up these muffins? I'd love one right now. :) PPS. do you have the nutritionals on these bad boys by chance? Haha...I wish I could magically teleport them to you because I totally would. ;) I don't have any nutritional stats on it right now...I'll see what I can do. In the meantime, you can always plug in the ingredients on SparkPeople - I believe they have something for that? I love bakery blueberry muffins - specifically Dunkin Donuts. You know how the top is all crusty and sprinkled with sugar? oh my gosh, by far the BEST!!! I can't have those anymore obviously, but this gluten free bakery near my house makes a blueberry muffin that tastes EXACTLY like the Dunkin Donuts one! Oh my gosh, girl, those are some of my favorite muffins too, LOL! What a fantastic idea! I'm still on the hunt for these new LC wedges! These look delicious! I tried Laughing Cow's new veggie cream cheese flavor the other day, and it is so good! Definitely going to try the strawberry next. I imagine these would be the best muffins ever. Seriously! These looks amazingly delicious and springy!!! What more can you ask for than strawberries and muffins? Mmm LOVE muffins with any sort of filling! I've made muffins with a PB banana filling that was just wonderful. But what I love more than filling is streusel topping!! Strawberry LC?!?! I need this in my life! Oh my goodness, these look phenomenal. I'm on it. I am SO making these this week! I love your "healthified" recipes! mmmmm Hummus! I see homemade hummus in my near future! I'm so making these! This is such a great idea for using those laughing cow cheese wedges! Strawberry cream cheese has always been my favorite and I'm literally drooling over here. What the what!? I haven't heard of that Laughing Cow. I have to have it! 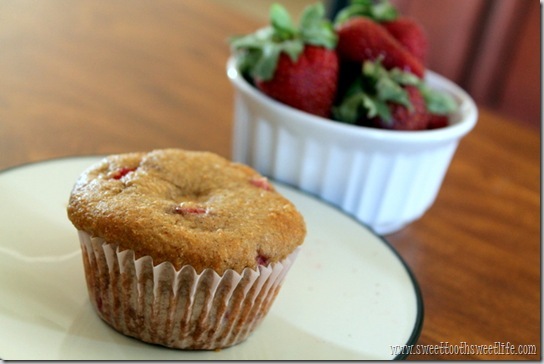 I really love strawberry on cake and muffins.. :) I will definitely try this out your recipe.. These are amazing!!!! I did sub unsweetened applesauce for the egg, but otherwise followed the recipe. Thanks for the delicious recipe! Can't wait to try out the blueberry ones! These are my favorite muffins. So delicious. I've been making them pretty regularly since you first posted the recipe. The only thing I change is using applesauce for the egg. Thanks for the great recipe.